CENTRAL QUESTION: How can we read the history of the essay as a history of art? This search soars across centuries, continents, and literary forms, from an ancient text by Ziusudra of Sumer to The Pillow Book of Sei Shōnagon to the prose poems of Baudelaire to a “performative essay” on Bob Marley by Kamau Braithwaite to a stunning meditation on love, lust, and the lyric by Lisa Robertson. Along the way, D’Agata carves out a story about the art of nonfiction that is plausible, and possibly even true. Faced with the fabulous diversity of the pieces collected here, a reader may begin to wonder: What is an essay? Blake’s “The Marriage of Heaven and Hell”? (Surely the poets claim this one.) Borges’s “Tlön, Uqbar, Orbis Tertius”? (Didn’t I just see that in Ficciones?) Artaud’s “Eighteen Seconds”? (Is there a genre for impossible theater?) 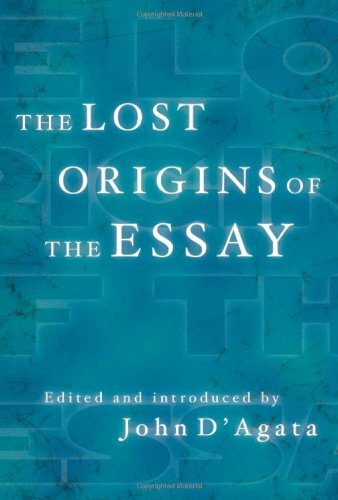 To complicate matters, some of these “essays” are excerpts from longer works, and others are new translations prepared specifically for this anthology. The skeptic may suspect the editor is tampering with historical evidence. And yet, if you follow D’Agata’s reasoning in the brief introductions that frame each text, you cannot help but see the family resemblance across “a form that’s not propelled by information, but one compelled instead by individual expression—by inquiry, by opinion, by wonder, by doubt… a mind’s inquisitive ramble through a place wiped clean of answers. ”Thought happens; imagination happens; the actions of the mind are events as real as the passing of wheat from one hand to another. Asking what an essay is leaves us groping for an answer to the wrong question. Perhaps we should be asking what an essay does: “think through,” “mak[e] arguments,” “set into motion the imaginations of… readers” . According to D’Agata, this action is always directed toward the internal acrobatics of the writer’s mind.“Montaigne was… the first to call it essai—literally, an attempt—a term that conveys the tentative, the speculative, the non-definitive, a term that turned inquiry officially inward… a term that finally freed this form from the argumentative posturing of political, religious, or scientific treatises, granting it the credentials to be recognized at last as what it has always been: art.” But does this suggest that something like a political treatise functions only as the dreaded receptacle of information (the Declaration of Independence springs to mind), or that rhetoric in service of a thesis is less artful than rhetoric that goes searching for one? It seems that even as D’Agata throws open the doors to the house of the essay, he closes a window somewhere else. Yet if we carefully consider his project—to search out origins for nonfiction rooted in art rather than commerce— his penchant for writing that looks inward doesn’t seem to undermine his credibility or his argument. He has gone searching for art. Look here, he says, I have found it. That any such tradition can be traced is his success.Whether this is the essay’s only tradition is another argument altogether. So, then, the essay can be seen as a method rather than a product, an act of investigation that speaks from a place of inquiry, not conclusion. As “‘a test,’ ‘a trial,’ ‘an experiment’—the essay is the equivalent of the mind in rumination, performing as if improvisationally the reception of new ideas, the discovery of unknowns, the encounter with an ‘other.’” The writing produced by this elastic method might be called many things: a prose poem, an essay, a book. In fact, if you read the pieces in this anthology as extended quotes between the main text of D’Agata’s own writing, you begin to see this book is, itself, an essay. D’Agata’s thoughts continue from one interstitial section to the next: “Sometimes the essay is where we end up when everything that we know must change… Sometimes it’s a journey that cannot ever end, to a place that might not exist… And sometimes it’s just a listing of those things we think we know.” These introductions reveal a single line of thought that moves forward and changes across the course of the book. After eight pages of Francis Bacon’s aphorisms, a form which D’Agata has introduced as “very much like a thesis,” he pauses and checks his reasoning: “And yet, a thesis statement, like an aphorism, precludes real essaying. It denies a text the possibility for reflection, discovery, or change.” Here, D’Agata is enacting the very movement he seeks to describe. He picks up his train of thought, shakes it out a bit, and lays it down in a new direction. This, then, is the great achievement of this book—that in searching for the origins of nonfiction as art, it creates the sort of art for which it searches.